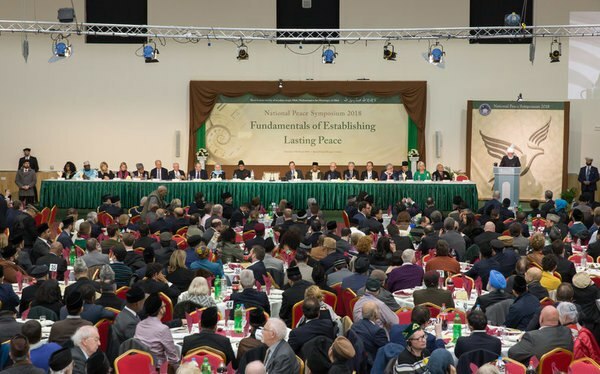 The 15th Peace Symposium was held in Tahir Hall (Baitul Futuh Mosque, London) on Saturday, 17 March 2018. The theme for this year’s event was “Fundamentals of Establishing Lasting Peace”. More than 800 guests attended the unique event including secretaries of state, parliamentarians, diplomats, faith and civic leaders as well as representatives from numerous charities and faith communities. 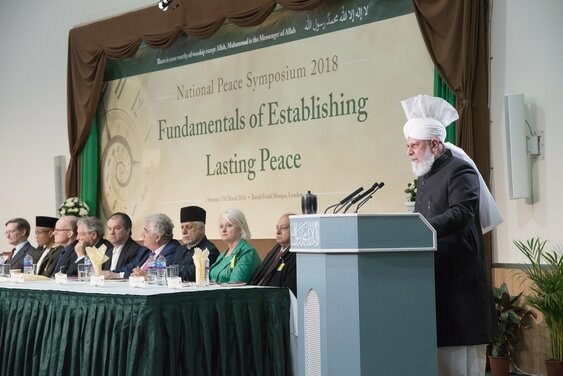 While talking about the need for holding this Symposium every year, Huzooraa said that as long as adequate steps towards establishing peace are not taken by the major nations of the world, it is a duty of Ahmadiyya Muslim Jamaat to continue calling the world to this noble cause and to never give up. Historically, Huzoor’saa addresses have given deep insight into the most pressing contemporary issues concerning the religious, political, social and moral décor of the world that we live in. Regarding issues such as climate change and the reduction of carbon emissions, Huzooraa said that although they are issues of great importance, a vast number of people living in the developing world live below the line of poverty and do not know how they will have their next meal. 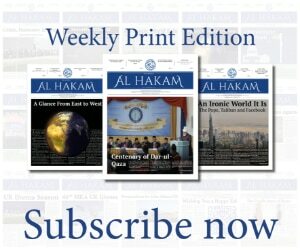 Every year, the Ahmadiyya Muslim Peace Prize is given to a charity or individual for the advancement of peace. This year’s Ahmadiyya Muslim Peace prize was given to Dr Leonid Roshal, Senior Pediatric Surgeon, Russia for his remarkable services to children in war torn areas of the world.